Are you tired of furniture makeover posts yet? I really hope not because we have a whooooole lot more coming. Between having to furnish my parents’ entire guest bedroom and replacing a lot of our existing furniture in the new house in a couple of months, Craigslist better watch out. I’m a comin’ for it. But oddly enough, while I was on the hunt for a pair of nightstands for the guest room, I had exactly zero luck on Craigslist and in thrift stores the past couple of months. Thrift shopping is so much harder in the winter because the inventory always seems low. (Spring cleaning and yard sale season needs to hurry up already.) So I ended up having to buy a pair of new ones. I managed to catch them on a major markdown at Kirkland’s and I had a coupon, so they ended up being about what I would have paid at the thrift store anyway. If painting new furniture is wrong, I don’t wanna be right. 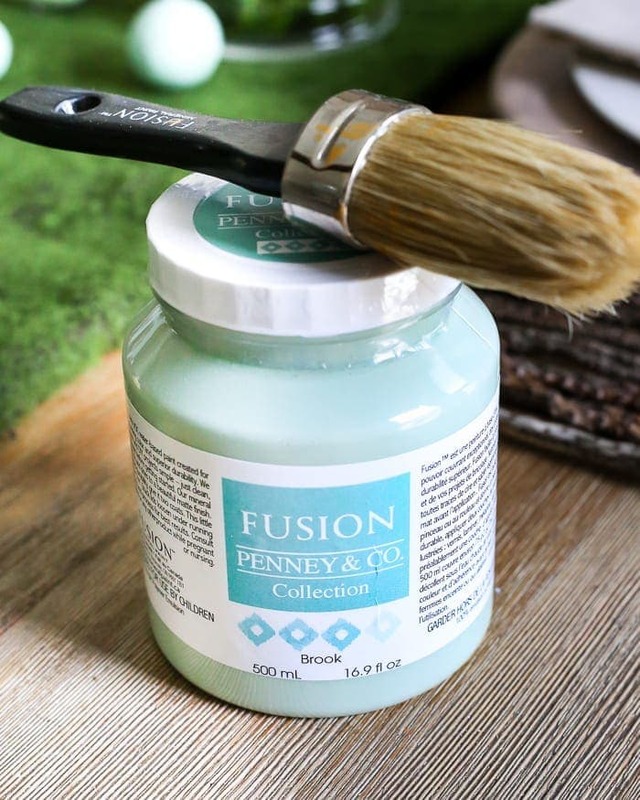 Since we’re sticking to blue and mint tones in this bedroom, I thought the Fusion Brook color would be perfect. But I still wanted to retain a little bit of wood. These nightstands were veneer, so I couldn’t strip them down and restain them like I did the French blue dresser, but I was able to get them looking very similar to a stain using the Algonquin color on the drawers followed by a layer of the Espresso wax. I’m LOVING this pretty shade of bluish green. And the rug I chose for in here has the exact same shade of mint in it as the nightstands now. My parents found the perfect bed on Craigslist that I was able to paint for them too, but I’ll be sharing more of that later as more of the room comes together. I can’t believe how far this space has come already. I mean… it was long overdue. *A big thanks to Fusion Mineral Paint for providing paint to sponsor this post. As always, all opinions are 100% my own. I will never tire of seeing furniture make-overs! AMAZING. Beautiful. I’m always shocked at the before and after photos – and I have a question. I’m curious as to whether your ability to see the possibilities in an area is a God-given talent, or something you’ve learned? No matter how hard I try, I wouldn’t be able to have such original ideas. I can copy what folks like you do, but to come up with the idea on my own would NEVER happen. Can you comment? Ya know… that’s a good question. Hmm…I’ve been a visual person for as long as I can remember. Before starting this blog, I was a dance and colorguard choreographer. My mom always said I had a little dancer in my head even when I was young because I would just invent choreography and visuals on the spot while listening to music. So I guess my little dancer has turned into a little decorator? I can “try out” different colors and move things around in my mind when I’m looking at something, so I guess that’s related. I’ve learned from watching others too, but I don’t ever remember a time when I couldn’t envision things. Sketching on notepads and playing around with room designs on Polyvore helps me visualize too though. What?! Mom! How did I not know that story?! Love that story! 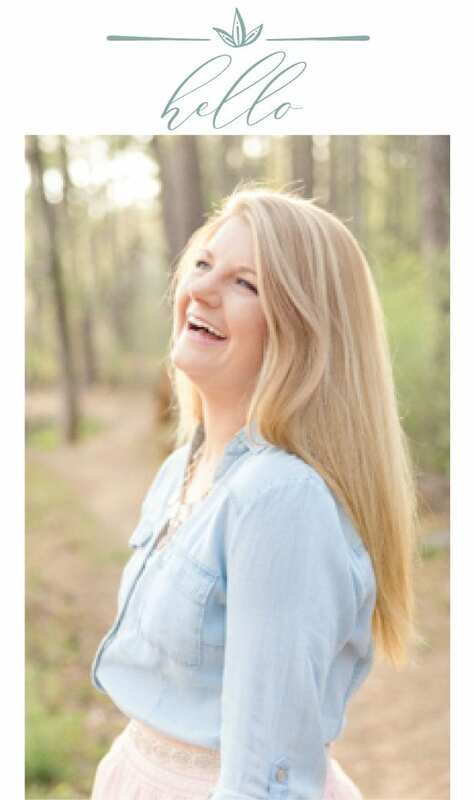 That answers my question – she was born with that blessing! Thanks for the answers ladies! Fabulous as always, Lauren! Trying to come up with some ideas for my own nightstands over here. It’s too bad I have a baby due in 3 weeks! ? Aw but you go enjoy every single minute of that thrilling anticipation. So exciting! Congrats! 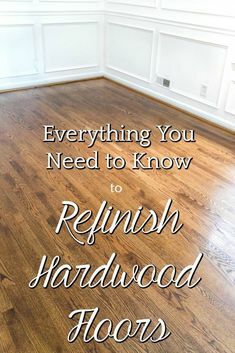 Would love to see the instructions on how to get the finish you created on the bed! 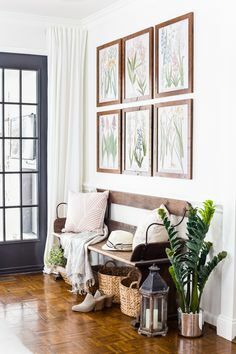 Hoping the “How To” will be included in your future posts as this room transpires! It’s gorgeous! 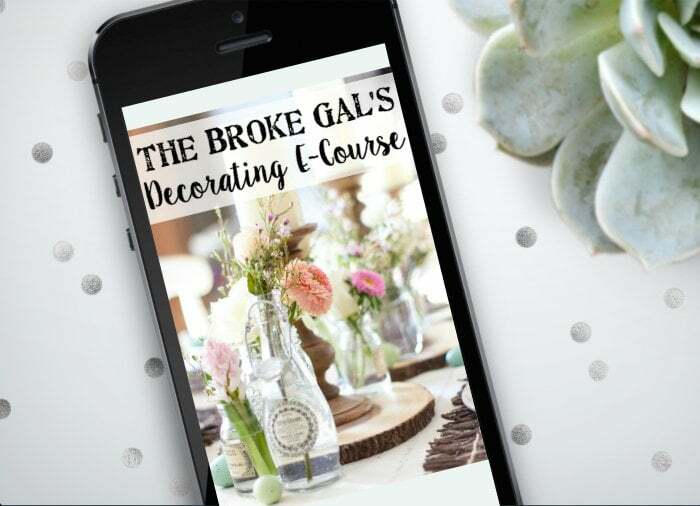 Can’t wait to see the tutorial on the bed…I’ve been wanting to paint the bed in our masterbed room and this just might be the inspirational post I need to help get me started! Beautiful work! Those turned out amazing! Great project, Lauren! I am always amazed by the makeovers. I always think “how can that piece be any cuter” and then it always looks so awesome! Keep ’em coming!!!! 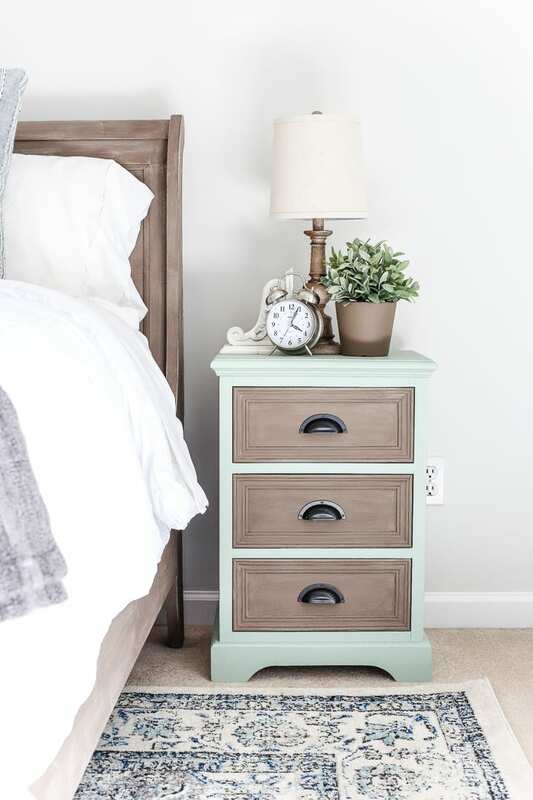 Love the two tone and the nightstands are such a great size and tons of storage too. Thank you, Marty! Yes! 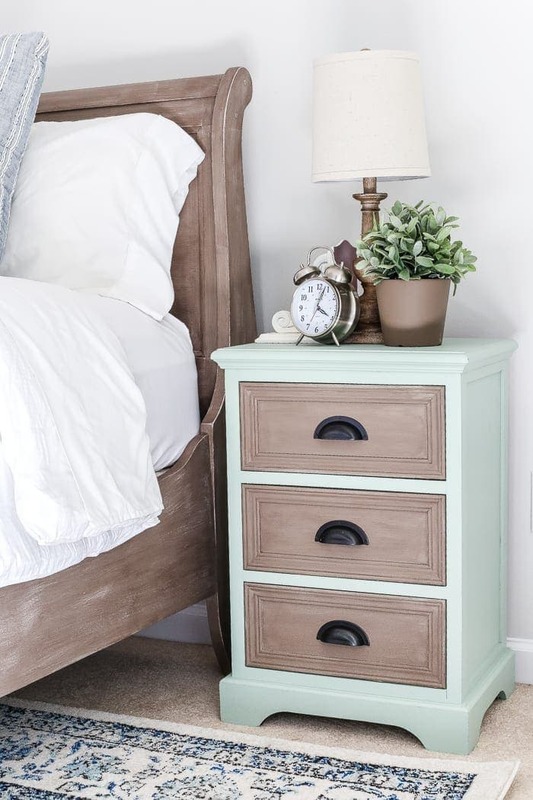 I always love a nightstand with great storage too. Beautiful! 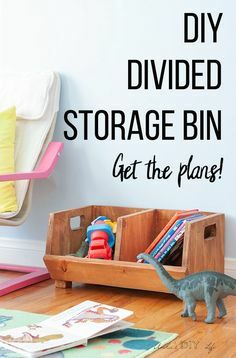 Can I ask for a little more details of how you did the drawers. 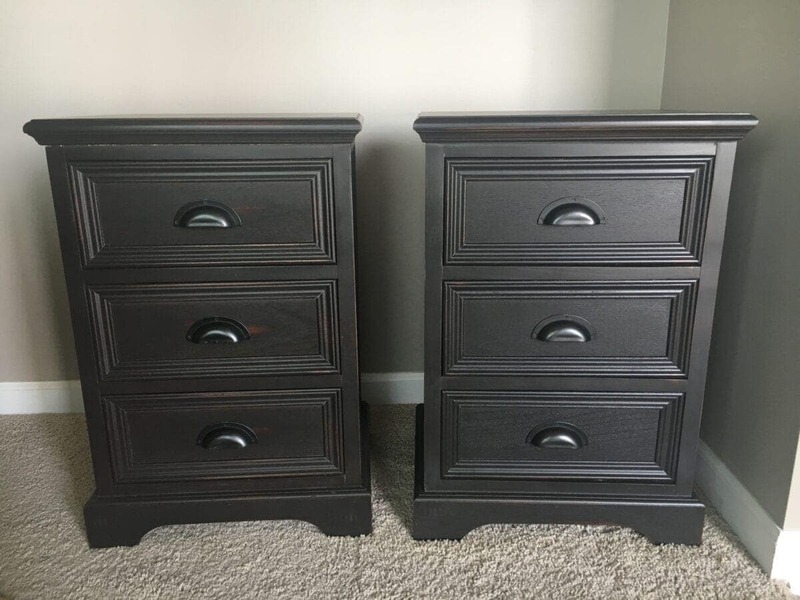 I have dark night stands that I would love to lighten a little, but I have no idea how to keep them looking somewhat like wood with painting. Hi Leeanna! 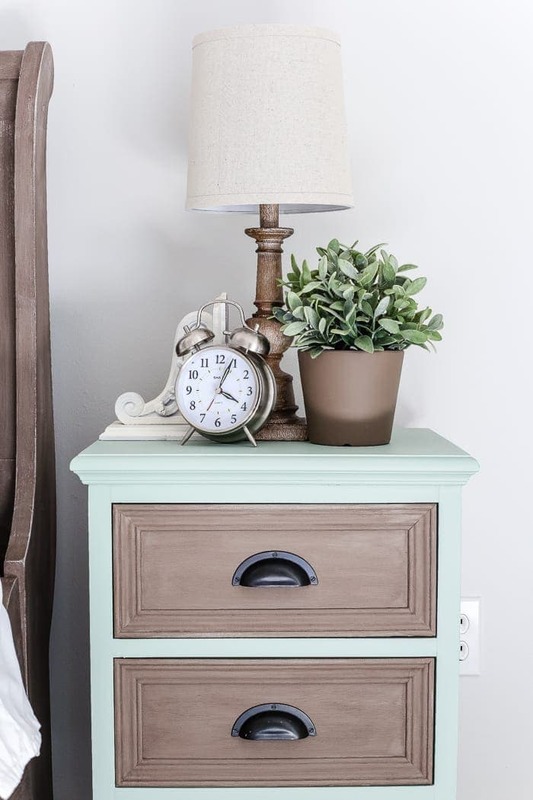 You can find more details about that step in this post: https://www.blesserhouse.com/2016/04/how-to-create-a-weathered-wood-look-with-paint.html I went a little lighter on the wax for these nightstands than in that previous post, but it’s the same concept. The room is coming along so beautifully! Congrats on the new house!!! I’ve missed something! “Between houses” “new house” What is happening? What blog did I miss? 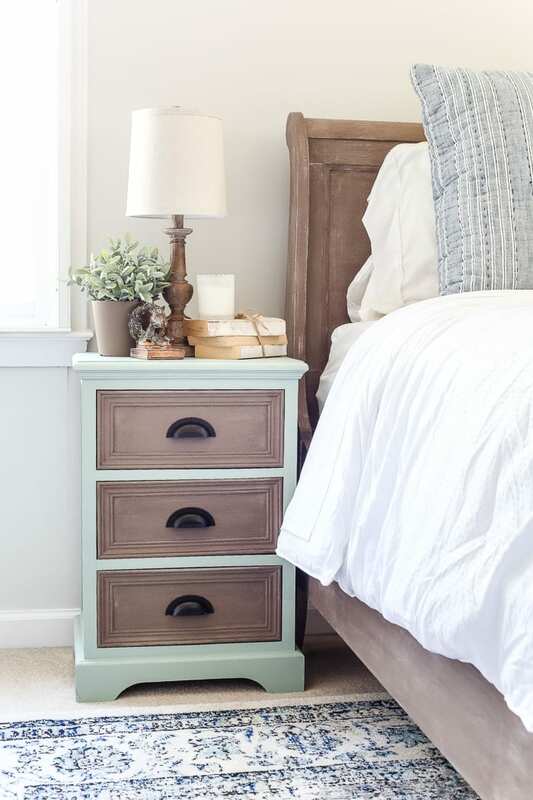 And, no, I’ll never tire of your furniture makeovers and the nightstands are terrific! I just discovered your blog. You are a very talented lady. I wish you the best during your move. We moved from GA to TX last Summer. I know that your new home is going to be beautiful. Can’t wait to see it. Blessings to you and your family. You have done a lovely job of this Guest Room! You have been blessed with a wonderful gift! May I ask where you got the bedside lamps from? Love the mineral paint finish! Subtle and lustrous. The night stands complement your bed so nicely without being too matchy-matchy. Great job! I’ve been looking for nightstands too, with no luck. I love how yours turned out. 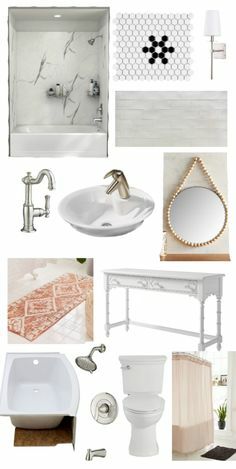 Pinning for inspiration! I am working on a couple of my first projects right now and man oh man I didn’t realize how much work goes into every project! 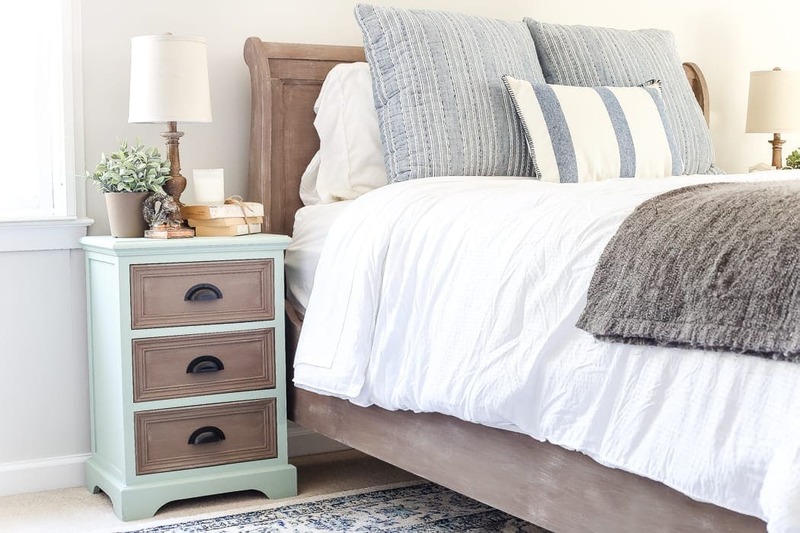 The nightstands look great…..I also love the natural distressed look that the bed is rockin’. Was that something you did as well or did you buy it like that? It goes faster with practice, I think. Or maybe after a while it just doesn’t phase you anymore. 🙂 I’ll be sharing the bed on Monday. It was a Craigslist piece that I painted and distressed as well.